El Arco, a rock archway carved by the surf, dominates the harbor of Cabo, which lies at the southern tip of Mexico's Baja Peninsula. Glass-bottom boat rides, snorkeling excursions and deep-sea fishing trips are popular in Cabo. Or, shop at the pier's souvenir market or relax on a beautiful beach. 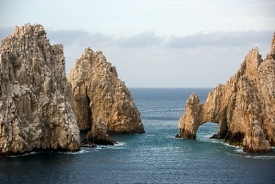 Small-ship cruises depart from Cabo San Lucas and sail through the Sea of Cortez.